Hello Linux Geeksters. As you may know, Twitch Indicator is an open-source appindicator for twitch.tv, a live streaming platform focuses on video gaming. It notices the users when a channel he follows goes live, the channel status being checked at every 6 minutes. 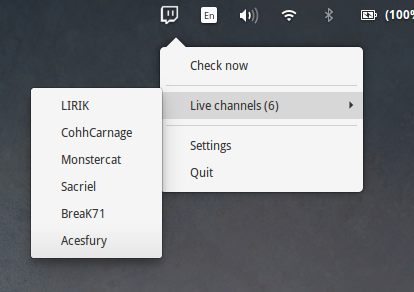 The list of live channels is displayed in the indicator menu and when a user clicks on a channel, the twitch page opens in the default web-browser. Also, the users can turn the appindicator from the settings. The latest version available is Twitch Indicator 0.24, which has been recently released, coming with some changes. In this article I will show you how to install Twitch Indicator 0.24 on Ubuntu 15.04 Vivid Vervet, Ubuntu 14.10 Utopic Unicorn, Ubuntu 14.04 Trusty Tahr, Linux Mint 17.1 Rebecca, Linux Mint 17 Qiana, Elementary OS 0.3 Freya, Deepin 2014, Peppermint Five, LXLE 14.04, Linux Lite 2 and other Ubuntu derivative systems.